UPDATED: Now with video from the press conference. Stephen Elop, Nokia's CEO took the stage at the Nokia Strategy and Financial Briefing conference, and announced a long-term strategic alliance with Microsoft for building a mobile ecosystem, which will be inclusive of chipset providers, carriers, software providers, developers, etc. Then Steve Ballmer pitched what Microsoft can bring to Nokia, like Bing, Xbox Live and a great user-friendly UI, and the floor was open for questions and answers. What's happening to Series 40? Ovi Portal? The low-end of the portfolio will be invested in more, and Series 40 will change over time, for now it is outside of the smartphone "pillar", which will be affected by the alliance with Microsoft. Ovi Portal will merge with the Microsoft Marketplace, which will be the sole point of access. When will the first handset arrive? Faster than what we've done before. What happens with developers for Windows Phone 7? Not exclusive partnership, they can keep doing stuff for the current crop of WP7 devices. Nokia's goal is to create an ecosystem together with Microsoft, and each and every experience will be appreciated and integrated. How did you come to this decision at Nokia? The company had three options - to keep the current state of affairs, adopt Android or use WP7. Nokia spent time with the Android people, but Nokia was worried they will be lost in the sea of Android handsets, and commoditization will be high, hence profits low. Future of MeeGo and Symbian? Over 200 million Symbian users now, and 150 million more handsets to be shipped until the transition fully takes place in the next months and years. The goal is to move to Windows Phone. Nokia will ship one device with MeeGo, and will use it in the longer-term to play around with it, and try to innovate the next disruptive technology in mobile thanks to MeeGo's open-source nature. 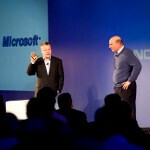 Will Nokia pay Microsoft to use Windows Phone? Are the Nokia operations leaving Finland? Nokia will always be a Finnish company, but the best thing it can do for Finland is to be successful, so that's what we are doing with Microsoft today. There will be substantial reductions in workforce, though. WP7 is a consumer platform, what will happen with the Eseries business devices? Windows Phone has been designed to be good for all aspects of people's lives, and having native MS Office support in Nokia phones will certainly help with the Eseries. R&D Expenditures? These will be substantially reduced, since they will be overlapping now, at the same time increasing productivity and innovation. EU and other carriers were hoping for a MeeGo based ecosystem to take on Apple and Google? Over the last day and hours when the decision was pitched, those carriers said "we understand, we like it and will support it" and even "Thank you, we are all smiles". How will Windows Phone expand into the mid-range, when you have strict hardware requirements? The Nokia experience with Symbian will help Microsoft come down market and at lower price points. A lower-end chassis spec which preserves the WP7 concept is certainly achievable, having Nokia's engineers on Microsoft's side, said Steve Ballmer. Does Nokia have a tablet strategy? We will take advantage of the future Microsoft tablet plans. You have effectively outsourced your software efforts to Microsoft, what will happen with feature phones? We have the capacity to compete at the low-end of the market with Windows Phone as well. At the moment WP7 is not very successful in North America, how will the Nokia partnership change that? There is a lot of excitement already from carriers, and Nokia is taking steps to ensure absolute focus on the North American market, which wil be announced later on. Nokia is being accused of being bureaucratic, how hard hit will be its numerous VPs? We will make significant changes how we operate and take out the unnecessary departments. A change in attitude and behavior is already happening at Nokia. The Nokia-Microsoft alliance is obviously a developing story and we are yet to hear more comments from carriers, developers, and consumers alike. Once again, upper management arrogance and failure to act when the whole world was screaming for change is causing tons of people to lose their jobs! Atleast it's happening now.. Good Luck Nokia. nah... this wont succeed. no multitasking... no apps... no copy paste... no mass storage. ewww ... android FTW!